Glaucoma is a common vision-threatening disease caused by damage to the optic nerve (the nerve connection the eye to the brain) usually due to increased pressure inside the eye. Vision that is lost from glaucoma cannot be restored. If detected and managed early, vision can often be saved. Symptoms from glaucoma are often not present until later stages of the disease. Thus, it is important to have regular eye exams, including evaluation of the optic nerve and eye pressure measurement. ​Open-Angle Glaucoma is the most common type of glaucoma. The drainage angle of the eye is wide enough, but the drainage apparatus functions inadequately. This leads to an increase in the pressure of the eye. Closed-Angle Glaucoma is less common. 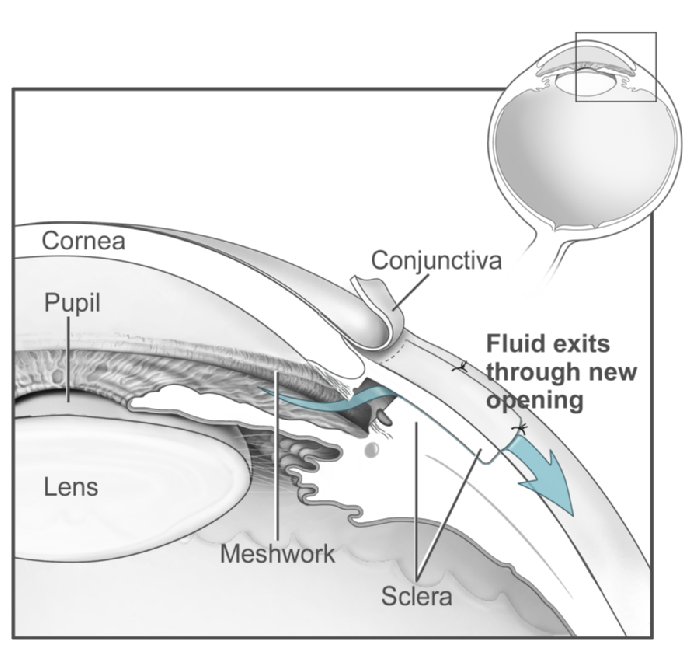 It can occur suddenly (Acute Angle-Closure Glaucoma) from a sudden, complete blockage of the drainage. Optic nerve damage may also occur even when the eye pressure is within normal limits (Normal-Tension Glaucoma). Thus, it is important to evaluate the optic nerve in all patients. Glaucoma is often treated with eye drops to lower the eye pressure. Other treatment options include laser, oral medications, and surgery.